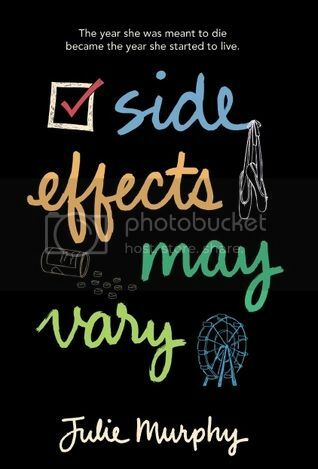 I was super excited to get my hands on Side Effects May Vary, as I had seen people talking about the book, and I was super curious to see what it was all about. I went into this book expecting something like John Green’s The Fault in Our Stars, or Melissa Kantor’s Maybe One Day. While the book had some similarities to these, mostly the dealings with cancer, that’s basically where the similarities end. The main character in this novel, Alice, was not a nice girl. It took me to almost the end of the book to actually start caring for her. I hesitate to say that I couldn’t connect with Alice,—in some introverted way I kind of understood her, and even her reasoning’s—but I didn’t care for the way she acted and treated people, so I had a hard time connecting. I do understand how she felt. She was scared of living life. Death was something that she could face; it was something that she had come to expect. Living her life after thinking that she was going to die, it’s something she just couldn’t handle. And because of that, she pushed everyone away. Thankfully she does have a bit of a ‘wake-up’ moment towards the end of the book, and we finally get to see a different side of dear Alice. This is when I really start to like her. Harvey, Alice’s best friend, was definitely the best part of this book. Oh, how he loved Alice. I hated the way that she treated him in return, and that she wouldn’t share how she truly felt about him. There was so much back and forth between these two, I really just wanted to smack them in the head and tell them to get their act together. But they had their moments, and those moments were very sweet. I was a little worried about the storyline for this book when I first started reading it. I’m seeing books about terminal illness pop up a lot lately, and I’m worried that it’s a subject that is going to be overused. This book was definitely able to hold its own against other stories with that involves illness. I didn’t include a whole lot of cancer terminology, and for that, I was kind of thankful. The storyline flowed really well, and I was able to read this book really quickly. Overall; despite it taking a long while for me to warm up to the main character, I found this to be a very enjoyable read. I’m really glad to have discovered this author; she has a way with words. I’m really looking forward to reading more from her in the future.